Get to know our friendly Fitness Together® Personal Training Staff at Beverly. Derek Maxfield enjoys seeing his clients reach their goals and looks forward to exercising. He strongly believes that nutrition is a very important aspect of fitness and finding the correct activity is the key to total commitment. 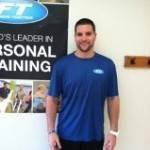 Derek is certified through the American Council of Exercise and has enjoyed working with clients ranging from 14 years old to 83 years old, from athletes to those who have had various injuries. He started his career working in a public gym, but joined Fitness Together in December of 2008 in Concord, MA. 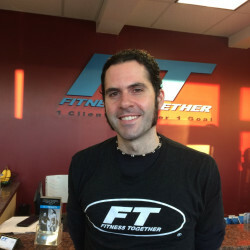 After two years of service which he thoroughly enjoyed, he became owner of Fitness Together in Beverly, where he has been since December of 2010. He has since been named the 2013 Greater Beverly Chamber of Commerce Young Entrepreneur of the Year, has actively participated in professional groups such as BNI, Beverly Rotary, and the Great Beverly Chamber of Commerce, in which he proudly sits on the Board of Director; and is the host of an award winning informational program called "Half Hour or Health" that airs on BevCam, Beverly's exclusive access television network. Derek enjoys golfing, running, and burning plenty of calories working on his yard. watching and playing sports, being outdoors and hanging out with his friends. Hey everyone! For those of you who haven’t met me yet, my name is Derek Clark. I am originally from Rowley, Massachusetts but I just recently moved to Beverly. Growing up in Rowley all I have ever really known is sports. When I was a kid I played pretty much any sport you can think of. Once I got into high school, at Triton Regional, I narrowed all those sports down to football, basketball and lacrosse. From there I narrowed those sports down to just one for my college career, lacrosse. I played four years of college lacrosse and finished up my education at Salem State University. Having played sports my whole life I graduated college with the only degree that made sense to me, Bachelors in Exercise Science. In my last year of college, I started interning at Athletic Evolution in Woburn, Mass. I interned there for three months focusing mainly on strength and conditioning along with sports specific training. I worked mostly with football and lacrosse players but I also trained younger kids. After the sports specific training I started another internship at the same gym but this time with the CrossFit program. I interned at Athletic Evolution with the CrossFit program for another three years before I got a job as a CrossFit coach at CrossFit Full Potential in Newburyport, Mass. I worked at CFFP for two years teaching adult and kid classes and doing one on one training. I am very excited to start this fitness journey with all of you! Hey there! I'm Dana, and I've been a trainer for over 3 years. My fitness journey began pretty much my whole life. As a child and into my teens, I had a multitude of back problems, scoliosis and sciatic pain to name a couple. I credit my mom always taking me the holistic route when it came to helping me better myself, through chiropractic care and acupuncture. So in my early 20s, I decided to take care of myself holistically by signing up at a local gym and working out with weights. I fell in love instantly. Weight training has helped me with, not just my back problems, but any joint pain I've felt along the way. Evidently, I grew a passion for helping people heal themselves naturally. When I'm not working as a personal trainer, or working out in a gym, you'll probably find me on a hiking trail, or on a mountain trail. In my idle time, I'm an avid musician. I'm a guitarist and have gigged, taught, and recorded frequently over the course of my 18 years playing. If you're a music fan, we'll have plenty to talk about. I look forward to meeting you!